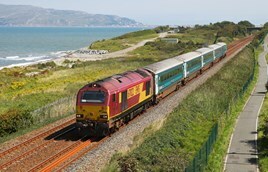 The devolved Welsh Government and the Department for Transport (DfT) have clashed over demands for compensation made by Welsh Economy Secretary Ken Skates, owing to the General Election allegedly delaying the Wales & Borders franchise process. Skates has also called for the rebate paid by current train operator Arriva Trains Wales to the DfT to go to the Welsh Government instead. For much more on this, and the Welsh Government's response, read RAIL 834, out now.